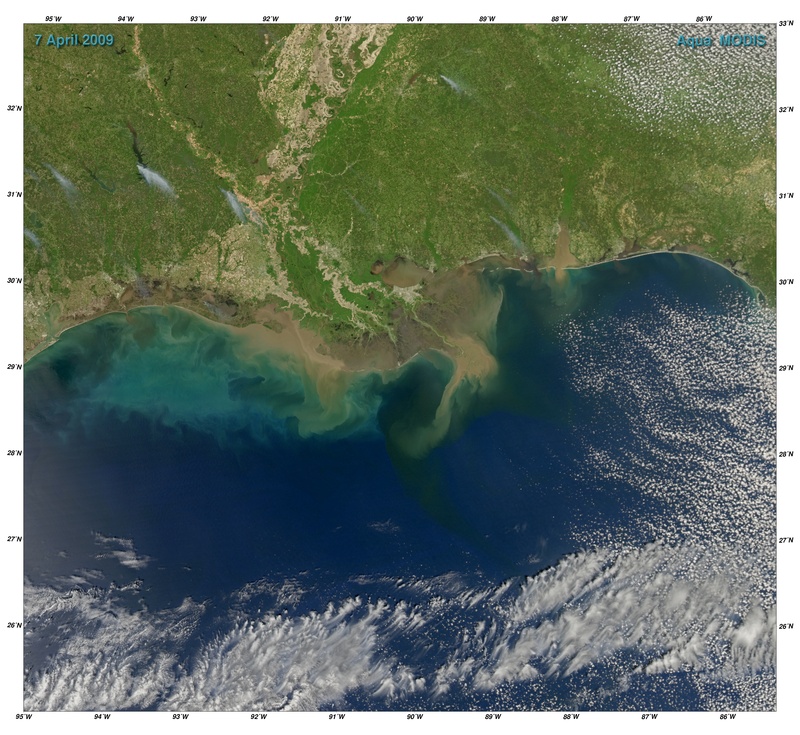 Sediment-laden water pours into the northern Gulf of Mexico from the Atchafalaya River in this photo-like image, taken by the Moderate Resolution Imaging Spectroradiometer (MODIS) on NASA’s Aqua satellite on April 7, 2009. 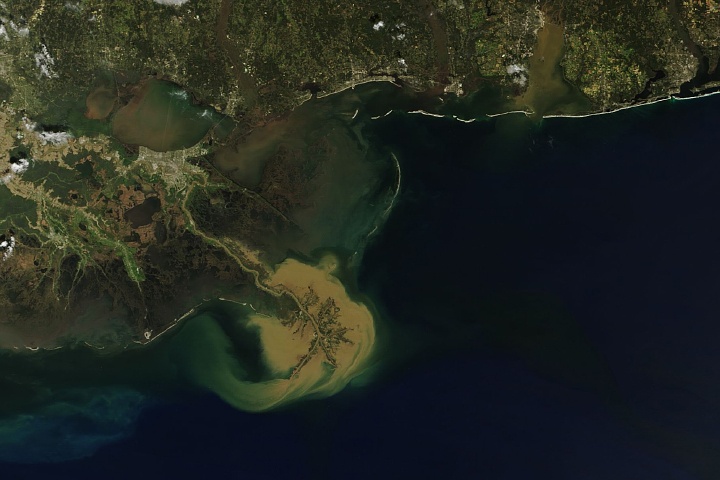 The springtime river plume is distinct in the sediment-laden coastal water, turning the water the color of land. The tan gradually fades to clouds of green and blue as the sediment disperses. The Atchafalaya is a distributary of the Mississippi River, a channel of the river that drains into the Gulf of Mexico west of the main channel. The plume is most distinct in the spring, when rains and melting snow wash over the central United States and flow through the rivers of the Mississippi River basin. On its way into the Mississippi, the water lifts millions of tons of soil from the farms that feed us. Historically, when springtime flooding swelled rivers, the sediment they carried resettled over the flat land near the river. Such seasonal floods left behind richly fertile farmland. However, floods are also destructive. According to the U.S. Geological Survey, floods caused more loss of life and property damage than any other natural disaster in the 20th century. To reduce the impact of flooding in the United States, levees have been built along the flood-prone rivers in the Mississippi basin, preventing the river from widening during spring floods. While the levees prevent flood damage, they also stop soil and other contaminants from settling out of the water. Instead, high concentrations of soil, fertilizer, other nutrients from farms, lawns, and sewage treatment plants pour into the northern Gulf of Mexico. 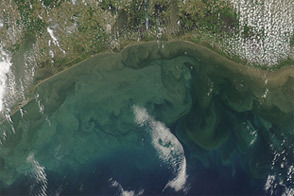 The infusion of nutrients into the Gulf fuels large phytoplankton blooms, dense blooms of plant-like algae that grow in sunlit waters at the ocean’s surface. As the plankton die and decompose, they deplete the water of the oxygen that animals need to survive, creating a large dead zone in the northern Gulf. NASA image courtesy Norman Kuring, Ocean Color Team. Caption by Norman Kuring and Holli Riebeek. 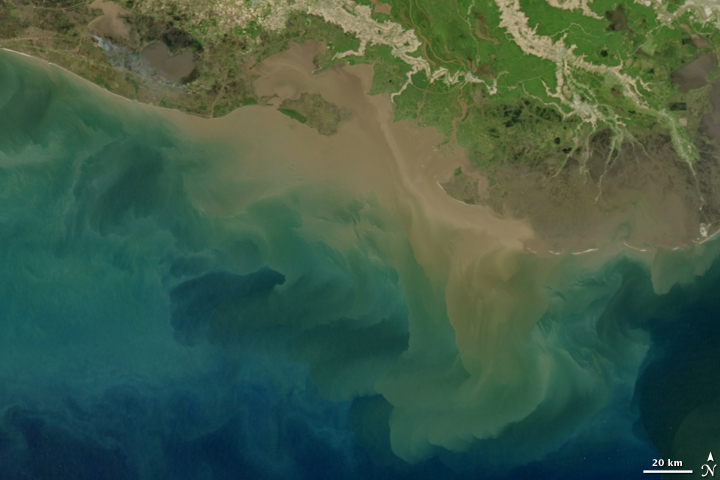 Sediment-laden water pours into the northern Gulf of Mexico from the Atchafalaya River in this photo-like image taken on April 7, 2009. Mitchell, G. (2009, April 10). Water monitor eyes farm runoff in Gulf of Mexico. Associated Press. Accessed April 17, 2009. National Oceanic and Atmospheric Administration. (2008, July 16). 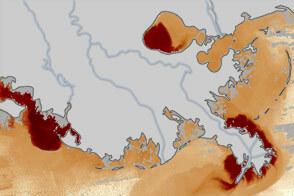 NOAA predicts largest Gulf of Mexico 'dead zone' on record. ScienceDaily. Accessed April 17, 2009. Kuring, N. (2009). Sediment Export. NASA Ocean Color Web. Accessed April 17, 2009. United States Geological Survey. (2000, March). Significant floods in the United States during the 20th century. Kansas Water Science Center. Accessed April 17, 2009. United States Geological Survey. (2008, May 9). Suspended-sediment database: Daily values of suspended sediment and ancillary data. Accessed April 17, 2009.